at the Uniting Church, Rutledge St Queanbeyan. RARQ and friends usually meet once a month for a chat and a cuppa at the Riverside Plaza. This occurs on the first Friday after our regular meetings, which are usually held on the first Saturday of the month. It's our way of keeping in touch and letting people know that we're here. It's also an opportunity for those who are new to Queanbeyan, or who may just want to converse in English, to join us. This year the numbers at the Palm Sunday rally were much bigger as the sense of frustration at government policy increases. RARQ had a good representation at the rally. The speakers were passionate and inspiring and included a speech via video from Berouze Boochani on Manus. RARQ attended the Carnival this year with more interesting art activities for children and a raffle. The event was held in the Queanbeyan Park on Sunday 3rd March. A large and vocal crowd attended the rally on the lawns of Parliament House, Canberra on October 16th, urging the government to release people held in detention - particularly children suffering on Nauru - into the community for immediate assistance and health care. Rural Australians for Refugees was well represented and organiser, RAR president, Marie Sellstrom, introduced the crowd to several impressive speakers. These included representatives of the local Ngunnuwal people, a doctor from Medicins Sans Frontiers who has just returned from Nauru, and others who had first-hand experience of the trauma experienced by those in detention. Shortis and Simpson sang a touching song written about children on Nauru and the crowd joined them in a rendition of We Shall Overcome. The urgency of the situation was the main focus of the rally which was attended by RSAR groups and other refugee support groups from far and wide. RARQ President Gerry Gillespie recently visited Wales as a guest of the Welsh Government to celebrate their achievements in recycling (now 2nd best in the world!). While there, he was impressed with the general attitude toward those seeking asylum and refugees, exemplified in the resource centre Oasis. 'Oasis Cardiff aims to help refugees and asylum seekers integrate into the local Cardiff community. It achieves this through the provision of personal support services, computer usage, clothing provision, cookery sessions, women only sessions, craft sessions and English language classes. The day we visited they were preparing lunch for an anticipated 100 or more people. Three cooks were in the kitchen where a new and very large ventilation fan has just been fitted. The dining area is the main hall of an old church building they rent from council on a yearly basis. The building also contains office rooms and a creche at the front of the premises for children, staff and management and several more rooms at the rear for English classes, art and clothing fitting with storage. Recent arrivals are provided with a full change of clothes initially at no cost. There is a restriction on this service due to the small space available for clothing storage. There is also a cafe area which is about a third of the size of the dining hall. The café is open all day and provides billiards, cards games and reading materials. The most recent addition to the Oasis services is a food van which was acquired at a much reduced price from and unnamed donor. The van has been a great success due to the ability to both serve food as a fund raiser but also to raise awareness of the needs of refugees. ​met near the north end of the Commonwealth Bridge on 21st July. The protest did not attract media attention, but it did attract many positive reactions from passers-by. Once again, the annual RARQ fundraising dinner held in celebration of Refugee Week attracted almost 60 people and was a great night for conversation, good home-cooked food and stimulating guest speakers. The event was opened by Dr John Minns who spoke passionately on the history of those seeking asylum in our country and the deterioration of human rights as carried out by recent Australian governments. The guest speaker, Mr Joe Ruis, held the attention of the crowd as he spoke of his experience as a child refugee from war-torn Spain in the Franco years. As Joe related the terrifying ordeals he and his family faced during that time, he pointed out that the main difference for refugees then and now was the fact that they had hope of a better life. The National Conference held this month in Wodonga was a very impressive event, with well over 300 people attending, including 3 RARQ members, who will give a full report on the conference at our May general meeting. The event was held over 3 days, with a full agenda of high-profile inspiring keynote speakers, a high school debate, presentations from former refugees and the choice of many helpful workshops. The highlight of the final day was the announcement of the Tampa Award which went to Behrouz Boochani. A phone hook-up allowed the award to be presented to Behrouz while the audience sang 'We Shall Overcome'. Those attending were left with many new strategies to pursue, the most important based on the suggestion from Prof. Gillian Triggs that we begin an initiative to ensure that Australia has a Bill of Rights. 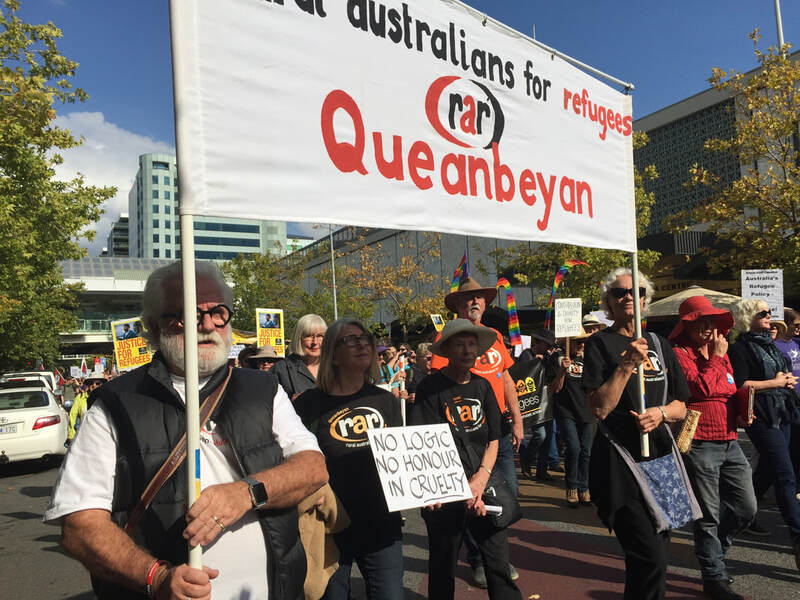 ​Members of RARQ were present at the festival held at Queanbeyan Park on March 4th, sharing a marquee with the Queanbeyan Writers Group. Our main activities were showing children how to use block printing on greeting cards, running a raffle, and chatting to interested members of the public about RARQ. ​Regional Forum this month. Dr Mike Kelly spoke to the group and took questions regarding Labor's policies towards those seeking refuge in Australia. Margaret Raza from the RAR National Executive gave an inspirational and interactive talk to the group about future directions and goals. Some RARQ members attend this wonderful event in the Queanbeyan Park. It was a happy, colourful day which reminded us of how fortunate we are as a community to have welcomed so many people from other cultures to our town. RARQ participated in the annual fair held at the Queanbeyan Uniting Church on Saturday 25th November. Our stall included food, plants and art activities for children. Funds raised will be a contribution to the church, which generously allows us to use their space for our meetings. Open Gardens Canberra and RARQ held a successful fundraising event in the rose garden of Gerardina Melssen on the weekend of the 18th and 19th of November. Many thanks to all who helped with the event, which was a major fundraiser for our group. Refugee Action Committee Canberra rally, Garema Place, Sunday 8 October. The rally drew a crowd of approximately 1,500 people and groups from around the region were well represented. The rally made front page news in the Canberra Times on the following day. Speakers included a former refugee from Afghanistan who told of the persecution of his people and family, leading to a difficult journey to Australia and detention on his arrival. Through sheer luck, he was not detained on Manus or Nauru and has been able to settle in Canberra where he now works and continues his studies. After 3 years as the foundation president of RARQ, Gerardina Melssen has resigned from her position. The committee of RARQ thank Gerardina for initiating the organisation in Queanbeyan, for her hard work and determination to expand and strengthen the organisation. Attached is the 2017 report from the president which was presented at the AGM on 2nd September. A call for urgent action! The national RAR organisation had released a plan of action to raise awareness and push for the release of those held on Manus and Nauru. The document below outlines this plan. July 19 marked four years on Manus Island and Nauru for the refugees dumped there. This was the day then Prime Minister Kevin Rudd’s PNG solution began, aimed at preventing refugees who arrived by boat from ever resettling in Australia. A candle light vigil was held in Reconciliation Park on Wednesday July 19. Despite the cold, around 13 people turned up and reminded passers by that those on Manus and Nauru have not been forgotten. RARQ celebrated Refugee Week by holding a fund-raising dinner at the Uniting Church in Queanbeyan. This is a chance for others in the community to come along and enjoy some good home-cooked food and lively conversation. In previous years we've shown a movie after the meal. This year we spent more time eating and talking and were also entertained by some talented local musicians: The Broken Arrows, Jane Sage and Gerry Gillespie. The evening started with RARQ president Gerardina Melssen introducing the Administrator of the Queanbeyan Palerang Regional Council, Tim Overall, who opened the event with a heartfelt speech on the subject of our area welcoming refugees and those seeking asylum. We were also honoured by the presence of Dr Mike Kelly, member for Eden-Monaro, Bryce Wilson, local ALP candidate for NSW, Katrina Willis and Greg Buckman - both Greens candidates for QPRC. We were fortunate to be presented with an impression of life in a Greek refugee camp by Suri Talip, who has recently returned from time there as a volunteer. The camp at which Suri worked prefers to refer to refugees as 'residents' and they're given every possible chance to retain their dignity and normality under such difficult circumstances. Suri's talk reminded us of the huge amount of displacement and suffering in the world at this time. Thanks go to all who helped out to make the event happen and to those who attended and supported RARQ. David Robinson from the Illawarra Forum and Maria Poulopoulos from Macarthur Disability Services conducted a valuable training program on February 24 which was attended by several RARQ members. The course was conducted at the Jerrabomberra Community Centre and was intended to raise our cultural awareness of others, covering the following subjects: Culture and Diversity, the Australian Migration Timeline, Refugees and Asylum seekers, Population Growth, Hofstede’s Cultural Dimensions Theory and finally Resources and References. ​David had arranged a direct skype link up with Emmanuel Bakenga, who is a refugee from the Democratic Republic of Congo. He lives in Wollongong with his wife and two children and works part time for Green Connect, a social enterprise which employs resettled refugees and local young people growing vegetables, keeping waste out of landfill and turning food waste into compost. Emmanuel trains and mentors other refugees at Green Connect. He is also studying a Diploma in Community Services to improve the support he can provide other refugees. He generously gave an account of his life in his homeland being turned upside down by war, the loss of his family and home and his time spent in a Ugandan refugee camp. He then went on to answer questions about the difficulties faced by refugees trapped in camps and the challenges they face living in a new country. ​The Connecting with Culture workshop was both informative and awareness raising for all of those who attended. Perhaps one of the greatest benefits for the day from an RARQ perspective, is that we now have a range of people working in areas relating to migration, age and culture who are fully aware of the existence of RARQ and who would welcome contact in the future. ​The NSW Government is supporting people seeking asylum and refugees who qualify for SHEVs. Thirteen people have been granted SHEVs in the ACT. These people will now have the right to work and study in the community for the next five years. They may then apply to renew the SHEV. Some of these young people will be seeking trade apprenticeships. RARQ are preparing to support any SHEV holder who comes to the Queanbeyan community. We are contacting local trades people and businesses to promote the availability of keen young people to become apprentices. Any RARQ Member or Friend who has business contacts who may be seeking apprentices could forward information to RARQ. ​‘IN SEARCH OF SAFETY: SEEKING HUMANITY’ is a community education program of the Australian Red Cross. Discover the stories behind the headlines. ‘Empathy is an important ingredient in the fabric of a healthy society. In search of Safety assists in giving people the capacity to share and recognise emotions and issues experienced by people seeking asylum and refugees, to assist in creating a more loving, flexible and understanding society’ says Carsten Pedersen, volunteer presenter. RARQ Committee took part in a preview of the DVD and interactive presentation with Red Cross Project Officer, Joe Thilakan. The project has versions to suit school children as well as adults. Community groups and schools interested in a presentation of “In Search Of Safety’ could email jthilakan@redcross.org. ​The Welcome Dinner Project aims to connect newly arrived people with established Australians. Dinners may be held in local homes, halls or other suitable venues. Equal numbers of newcomers and local people are invited by the Welcome Dinner Coordinator. Newcomers may be identified through the Queanbeyan-Goulburn Multicultural Centre, through Companion House or ACT Refugee groups. Anyone interested should register at www.joiningthedots.org. Despite a bleak, cold day, a keen contingent of the RARQ group held a march in the CBD, followed by a picnic in the park. This event gives expression to those of us who welcome people from other countries, particularly those seeking shelter, to our community. Next time the subject of refugees and people seeking asylum 'taking our jobs' comes up, you might find this very condensed version of the story of how the Karen community from Myanmar has lifted the economy of a small country town in Victoria. Members of the RAR Queanbeyan group attended this conference in September and have reported back to members on some positive new strategies arising from this event. On 16th July RARQ hosted the Inaugural Regional Forum for groups from the South East of NSW. The forum was also attended and received helpful input from Bendigo RAR founding members, Jan Govett and Gill Wells.